Scientists have found what they believe are pieces of a meteor that fell to Earth earlier this year. The objects were discovered July 2 off the coast of the United States in the Pacific Ocean. They were found near the northwestern state of Washington. The crew of the Nautilus, a private research ship, recovered the rock particles. The search was launched after U.S. government weather stations observed a large meteorite exploding four months ago. The explosion lit up the sky and sent the rock particles falling to Earth. They landed in the Pacific on March 7, about 25 kilometers off the coast of Washington. Marc Fries is with the U.S. space agency, NASA. He says the meteorite fall was the largest recorded over the United States in at least 20 years. Fries is part of the latest exploration team searching for meteorites. He said in a telephone call he “could not be happier” with the discovery, the Seattle Times reported. “This has been the experience of a lifetime,” he added. The team includes scientists from NASA, the Olympic Coast National Marine Sanctuary and the University of Washington. The scientists examined what they believe were two small meteorite fragments. Further testing is needed before they can confirm that the material came from the explosion in March. The Nautilus is equipped with two remotely operated vehicles (ROVs), called Hercules and Argus. These robotic submarines help researchers find and collect materials from the seafloor. A specially-designed scoop and magnetic tool were also used in the search for meteorite particles. Fries says information about the meteorite’s explosion led scientists to think that the blast was unusually strong. The fact also that the particles landed in the ocean, instead of on land, means larger pieces may have survived and can be studied. 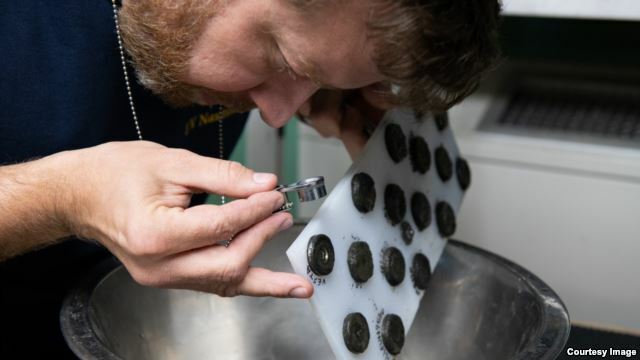 For this reason, Fries told the Live Science website, scientists decided to launch the “first intentional search for meteorites from the ocean.” Until the latest research, scientists had only accidentally discovered a small number of meteorites from drilling operations. “The meteorite fragments are small, melted pieces of rock,” Fries told Live Science. He thinks the objects recovered from the bottom of the sea likely came from the recent explosion for two main reasons. The first Nautilus meteorite ocean mission mapped and searched within a one square kilometer area. The exploration team expressed high hopes for future searches. “If successful, this will be the first known recovery of a meteorite from the ocean!,” the group reported on its website. Bryan Lynn wrote this story for VOA Learning English, based on reports from the Associated Press, The Seattle Times and other sources. George Grow was the editor.